“I saw Joe’s big smile as he got off that bus and knew we were going to be friends,” Jimmy Sutman recalls. Jimmy has immeasurably improved the lives of hundreds of challenged individuals and their families. But it started with Joe. Since that first day in 1994 at MASCO, Jimmy and Joe were instantly inseparable. Before long, Jimmy was taking him to ball games, movies and meals, and befriending his family. Joe increasingly became difficult for his family to handle, so Jimmy dedicated himself to providing him a home. That act of kindness begat ISLE (Iron and String Life Enhancement), a nonprofit Jimmy started to provide residential, respite, advocacy, transportation and vocational services to Mahoning and Trumbull County individuals with various disabilities. Today they employ over 400 professionals who oversee numerous activities. They also house and care for 88 individuals in 22 separate apartment buildings and homes throughout the region. Various components form the whole of Jimmy’s outreach to the disabled: Iron & String provides residential, respite, advocacy, transportation and vocational services to individuals with disabilities in Mahoning and Trumbull counties. Iron & String is the parent company of the other components. Golden String helps adults and children with disabilities realize their fullest potential, and offers community-based activities, recreation and socialization. Five ‘Habilitation Centers’ in the region serve their clients, including Purple Cat Productions, where clients perform in theater and music; Farmer Casey’s Ranch in Coitsville, where clients tend to a large menagerie of animals; and Golden String Radio, where clients become disc jockeys and format all genres of music and communicate through the internet. 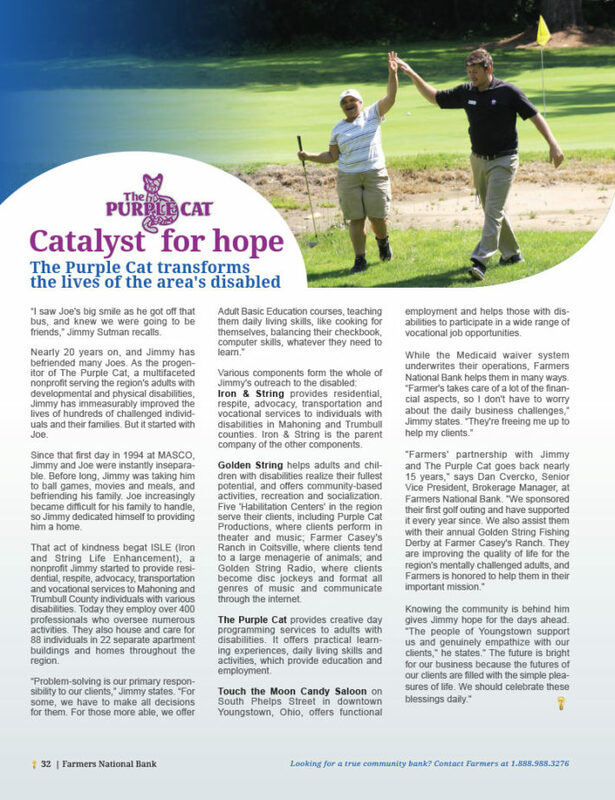 The Purple Cat provides creative day programming services to adults with disabilities. It offers practical learning experiences, daily living skills and activities, which provide education and employment. Touch the Moon Candy Saloon on South Phelps Street in downtown Youngstown, Ohio, offers functional employment and helps those with disabilities to participate in a wide range of vocational job opportunities.